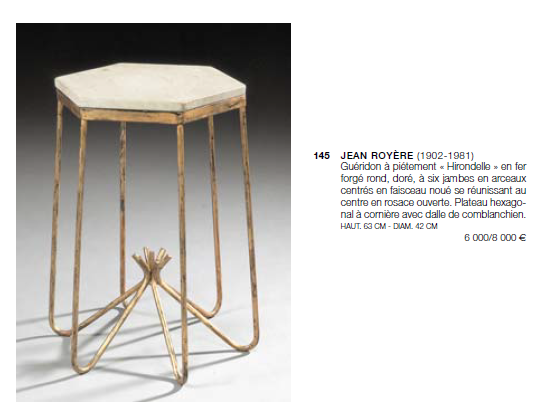 On November 24th, 2003, TAJAN auction house sold a hexagonal wrought iron base side table for $13,500 (Exhibit #1). On the Jean Royère’s production scale, a major symbolic figure of the French design of the mid-century, this table surprisingly appears to be common. It happens to be for sale in dozens of online antique shops, and it’s often seen in North-American flea markets with stone, glass or wood tops. Not only has TAJAN firmly assigned this table to Jean Royère, but several other auction houses also made the same mistake: PALM BEACH MODERN AUCTION (4 times, including 2 on May 14th, 2016), RAGO (3 times) and SKINNER (Exhibit #2). Suspicious, the PATROL decided to take on the case. Despite intense research, the PATOL hasn’t been able to locate this side table « by Jean Royère » within DOCANTIC’s database. The PATROL thus decides to contact Jean Royère’s archives’ holder to get his opinion on this attribution. The person we got a hold of could not find any record of this model in 6,000+ period documents (drawings, sketches & photos). Could this be a misattribution case by TAJAN?! After rummaging under every bookstore’s shelves, dusting off every library’s books and trying to convince producers to launch a new season of “Without a trace”, the PATROL decided to expand the range of research. Since some dealers would advertise the table as an “hirondelle” model (French for swallow), referring to Jean Royère’s famous sconces (Exhibit #3), why not get in contact with pet stores?! After all, Raymond Subes and René Prou did collaborate on an hexagonal bird cage in the 40’s (Exhibit #4)! Could TAJAN have messed up big time? Stuck between curiosity and skepticism, the PATROL’s investigators finally decided to work on this case. Although TAJAN got pulled over (too) many times by the PATROL, there is no way the auction house’s experts could have mistaken a table made by one of France’s top designers, with a bird cage?! Thank God, the side table is not a bird cage! It's just a FISH TANK!!!! This “side table” is indeed perfectly similar to fish tanks for sale on eBay and Kijiji Canada (Exhibit #5). Once the attribution mistake spotted, the search for the true artist who will undoubtedly showcase TAJAN’s huge fail began. Each single seller on Kijiji has been personally contacted. All had bought the used fish tanks several years ago, and therefore weren’t able to provide the PATROL with any manufacturer and/or dealer’s name… but one! This seller directed the investigators to “Big Al’s”, a famous pet store retailer in Eastern-Canada (Exhibit #6). Could TAJAN even have gotten the continent wrong?! A first for the PATROL! The PATROL reached out to the shop mentioned, whose workers were unable to recall selling this product in the past. “Big Al’s”’ HQ located right behind the Canadian border wasn’t of much help either: the associates couldn’t dig into the archives database without a name and/or a reference number. Another dead-end. The PATROL will later learn that this industry had been completely reorganized by several bankruptcies, mergers and acquisitions in the near past, which justified the new corporates’ “amnesia”, consequently unfamiliar with the past collection of the company. Back to base 1. Since most of the second-hand aquariums were for sale in Toronto, the PATROL decided to contact over 25 pet shops in Ontario. After receiving many answers, exploring each single lead and nearly all of them brought the PATROL to yet another dead-end, one brought them to “Miracles Aquarium”, a fish tank manufacturer (Exhibit #7). The PATROL called Miracles Aquarium’s manager, who recommended the investigators to get in contact with Star Aquariums’ team, known for their broad knowledge on the Northern-America fish tanks’ industry. Star Aquarium’s manager shared his doubts regarding the stand. According to him, it seemed to have been made in the US, with glass panels that could have been added by a Canadian company. He therefore suggested the PATROL to get in contact with “Zoo Med Laboratories” founder in California (Exhibit #8), who apparently holds an uncommon collection of aquariums and documentation on fishkeeping. A cousin (and neighbor) of DOCANTIC?! Cool! After two weeks of intensive investigation, was the case about to come to an end? The PATROL got in contact with “Zoo Med Laboratories,” and this amazing collection’s owner Gary Bagnall, who confirmed TAJAN’s mistake. The “table by Jean Royère” sold on November 24th, 2003 for $13,500 is actually an aquarium stand made by “O’Dell Aquarium Manufacturing” in the 70’s and worth no more than $150 (Exhibit #9). A few days later, Gary Bagnall confirmed his own expertise by providing the PATROL with the March 1973 issue of « Tropical Fish Hobbyist » in which the very aquarium was advertised (Exhibit #10). DOCANTIC and the PATROL wish to thank every single manufacturer, dealer, individual and collector that helped and solve this case by sharing their knowledge for the good sake of the art market. A special consideration is to be paid to Mr Gary Bagnall. In fact, if the great majority of the contacted people did their best to help the PATROL, the founder of “Zoo Med Laboratories” is the only one who was able to close the case by providing the undisputable proof. The solution came from documentation… this is precisely why DOCANTIC was created!